Here a former cavalry barracks dating from 1865 has been converted into a fine arts academy. Workshops and studios occupy what used to be the stalls and arena. The inner courtyard contains two new blocks of facilities including a library, an auditorium, a gallery, a studio and offices. 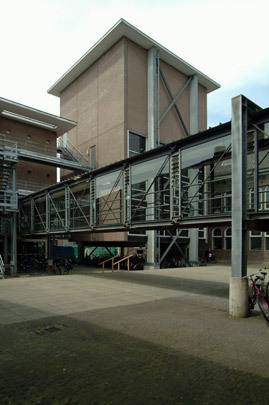 Footbridges link them to each other and to the existing building. At the rear along the water is a small restaurant. The new additions display Van Velsen’s customary architectural complexity, yet have brick cladding so as not to stand out too much from the existing building.